Passionate JVS Ambassador Ruth Abrahamson Honoured with Shem Tov and Volunteer Service Awards | BASE Consulting and Management Inc. The UJA Federation of Greater Toronto has paid tribute to Ruth Abrahamson, CEO, Base Consulting & Management Inc., with the Shem Tov (Good Name) Award, recognizing leaders representing the highest levels of excellence in volunteer service in Toronto’s Jewish community. 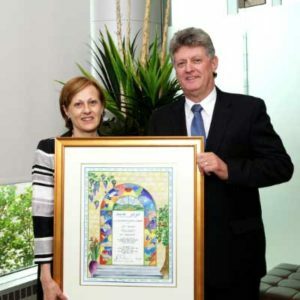 The award salutes Ruth’s many contributions to JVS Toronto, an agency providing employment, social and educational services across the Greater Toronto Area. “Ruth has proven to be one of JVS Toronto’s most passionate ambassadors,” reads the JVS announcement. Ruth joined the JVS Board in 2001, served for two years and returned in 2004. She joined the Executive Committee as Vice Chair of the Board in 2006 and served as Chair of the Board from 2010 to 2012. She has held the position of Past Chair and Co-Chair from 2012 to 2014 and most recently was Co-Chair of Strictly Business.